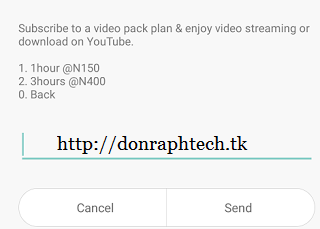 MTN NG following suit, the recent launch of hourly plan by 9Mobile (Etisalat) has decided to secretly introduced Youtube hourly plan also. The two new hourly data plans offer MTN subscribers the ability to choose between the 1hour for N150 and the 3hours for N400 YouTube streaming data. Though no any information regarding the data cap if its limited or unlimited but at the end of your 1hour plan, the data will expire. This Youtube bundle pack is new and not all MTN staffs are even aware of this latest development. And to check your MTN NG Youtube hourly bundle balance, dial *559*18#.